A chronicle of my 52 week photography challenge. The ups and downs of making a photograph each week based on the schedule from Dogwood Photography. This week's challenge is angles. "Angles : 90° 180° -- Show us an interesting photograph with an angle." I had a clear idea of what I wanted to shoot this week, The Seattle Central Library. It was designed by Rem Koolhaas and is full of very cool windows and angles. Photo by DVD R W. See, lots of cool angles. How could this go wrong? My plan was pretty straightforward. The weather report said that it was supposed to be sunny later in the week so I would take a little longer lunch on Friday and zip down to the library and take about a half an hour and take several pictures. I do have a confession to make though. Despite the fact that I am a proud native of Seattle, I have never actually been in the library. This would be a great time to correct that. Photo by Joe Mabel. Look at that thing! The design still holds up 35 years later. So I started walking the few blocks towards the building and started taking pictures. I like the abstraction of the building and the repeating pattern of the windows. I really like how the color of the sky is reflected on all of the glass, along with the trees in this photo. The sharp lines of the building are very cool. I love the shadow and then the reflection of the other building in this one. It's amazing what you can get in just a few minutes. On my way back to the car I was able to capture a few other nice surprises. Sometimes there are advantages of shooting during the middle of the day. Now, I know what you're thinking. Those are some nice pictures. I even really like the one with the trees in it but where are the library pictures you led with? Fear not, they are next. As planned I hopped in my car and zipped downtown and grabbed the first parking spot I could across the street from the library. I just started walking around the library and took shots as I went focusing on the unique angles and details of the building. It's kind of hard to take a bad picture of the library. This thing is made for photographers. I then went inside. I worked my way all the way up to the top and then worked my way down taking photos as I went. Looking into one of the corners. Looking out from one of the meeting rooms onto the atrium of the building. This is also my wife's favorite that I took of the library. The combination of the soft acoustic tiles and hard angles is awesome. Looking down from the highest point. On my way back down now. How cool is it that they embedded the Dewey Decimal numbers in the floor like this? Looking up to the top of the atrium. One final look before I left. Both shoots were a lot of fun. As was the case with my previous challenges I wish I had been able to take more time. I only had about 20-30 minutes both times this week before I had to get back to work and regular life. Going forward I will need to figure out how to schedule more time to be able to focus on what kind of image I'm trying to make. I have a feeling though that this is the case with all photographers, not just ones who are trying to cram in a project during their lunch hour. So, which photo did I choose to submit this week? My wife's favorite, of course. Next week's challenge is water. "Water : Fluid, Frozen, Splashing or Soaked?" I have a few ideas already. I can take some long exposure photos of the streams and waterfalls at Kubota Gardens or maybe head down to the shore at Lake Washington, I do live like 3 blocks away. Stay tuned readers for more adventures. With last week's assignment, Seasons, I knew in an instant what I wanted to shoot. I had a clear vision right away. This was not the case with this week's challenge. I struggled to come up with a concept. The assignment for this week is "New Begining." Some of the participants are taking pictures of new hobbies they have started this year while others are posting pictures of other random new things in their life. My first idea was to shoot some of the construction going on in the neighborhood next to mine in Seattle called Georgetown. Georgetown used to be a company town that was incorporated in 1904 largely as a defense against prohibitionism (awesome, right?). Later it was annexed into Seattle. The original Rainier Brewery, located in Georgetown is being rehabilitated. A large part of it had to be torn down due to it being unsafe. A portion of the rest is currently being renovated. At lunch earlier in the week, I went down to the always fantastic Calamity Jane's. As I walked along the street I took several shots of the work being done. Unfortunately, I wasn't able to get close enough nor have a long enough lens to get the shots that I wanted. The other issue I had was the blah grey skies. Some of the completed construction. Also, yay for adjustment brushes in Lightroom! I was able to underexpose the sky and make it look a little more interesting. While I liked the pictures that I took, I wasn't in love with them and they didn't scream "New Beginnings" to me. I had a client meeting in downtown Seattle later in the week so I took along my camera and took a few shots as I walked to lunch and back to my car. There was a large skyscraper being built so I took several shots of that. The photos are okay... just not great. Nothing to do with the assignment I just loved the repeating pattern and the angles. A typical picture of downtown Seattle over I5 facing south. Oh, contrasty, grainy, AND black and white. Now that's art! Since I still was not quite pleased with my photos from downtown. I embarked on taking some other pictures based on an idea from my lovely wife. FLOWERS! As many of you saw in my first blog post, I got a flash and some very nice lighting equipment for Christmas. My wife has a winter Paperwhite bulb growing in our garden window. It just blossomed so I took some photos using my flash off camera. I also used one of the extension tubes I got for my birthday so I could take some closer up macro photos. Extension tubes are added between your camera body and the lens so you are able to take pictures MUCH closer to your subject (It's how those super cool close-up photos of bugs are taken). I like how the colors of the white petals and the yellow pollen pop. This one is kinda dreamy. While this week has been a struggle to find something that I was pleased with technically, artistically and fit the theme of the challenge, I am glad that I have struggled. This is the point of embarking on a large personal photography project. I get to struggle and work through challenges that I normally would not have come across. If you look at my Flickr or Facebook pages you will see that there are A LOT of pictures of The Boy. He is my favorite muse. I have learned a lot about photography trying to capture better and better pictures of him. He gets more and more challenging as he gets older so it works out well. While this is great I do need to expand my comfort zone and try new photography challenges. So, what picture did I decide to submit? I love the texture of the brick and that they are working to bring new life to an amazing old building. When I first made the website I hadn't taken the time to go through my images and select my best for my portfolio. Instead, I selected a bunch from my trip to Italy last year with the intention of going through my images later. I have read over and over again to select only the very, very best of your images to display. I was shooting to include only my best 20. It ended up being too difficult to go from 11,000 photos to only 20 so I ended up with 34. Please take a look and enjoy them. Let me know your thoughts and thanks for taking a look. The first assignment was posted last night on Digital Photography School. It is titled "Seasons." Whatever the season looks like or means to you in your area of the world. The author of the post is in Melbourne, Australia so January is grilling time for him. As soon as I saw the topic I immediately had my idea for the assignment. Here in Seattle November through April generally means mid 40's and drizzling rain. Lately though it's been colder, mid 20's at night, and lost of frost in the morning. I hope all of the weeks are this easy for me to get an idea. After I dropped The Boy off at daycare I headed to our local japanese garden, Kubota Gardens. To say that Kubota is beautiful is an understatement. In the spring and summer it is often used for wedding, engagement, or quinceañera photo shoots. My family goes to Kubota year round and are aways amazed at the variety of beauty throughout the year. Given the heavy frost we've been having I thought there might be some great opportunities for shooting. The first thing I was fascinated with was all of the decorative grass that was covered in frost. I then worked my way around to one of the main ponds, the Spring Pond. This pond is always popular with people taking snapshots, though I've struggled with taking a picture that I've really been happy with. I was able to capture the fog rising off of the water this time and the greenery that is always present here in the Pacific Northwest. One thing I did not realize is that it was cold enough for some of the ponds to partially freeze over. The ice formed beautiful patterns in the water and the low sun reflected nicely on it. Finally I got this picture of the Moon Bridge covered in frost. I wish that i had enough time to get up to the Heart Bridge. It would have looked really spectacular. Next time I'll head straight for it. I'll also try to get there in time to set up for sunrise. In the end I'm only able to submit one photo for the challenge. I love the first photo I took of the grass covered in frost though I've decided to go with the fog rising from the spring pond. The assignments for the next several weeks were announced along side this weeks. Lots to think about for the upcoming themes. I'm sure I'll come up with something. A photo shoot with The Boy that ends up with some surprising results. While I'm waiting for the weekly challenges to start from Digital Photography school I decided that I should start learning how to use the flash and lighting equipment that I got for Christmas (Thanks Mom and Dad!). I wasn't sure what I was going to shoot. At first I thought I would take one of The Boy's giant stuffed animals as my model and just start moving the light around it and vary the intensity of the flash to see what results I got. Not exciting, though educational. Life can't always be exciting when learning something new. During my daily reading of the news and photography related sites I stumbled across Jared Polin's monthly challenge for January. In it he wants pictures of your bedroom. I thought, ah hah! Jonah and I will often rough house and play on the bed in our spare bedroom. I would set up the lighting equipment and have The Boy jump up and down while I shoot away and make adjustments to the camera and flash. The Boy LOVES to jump, genius! 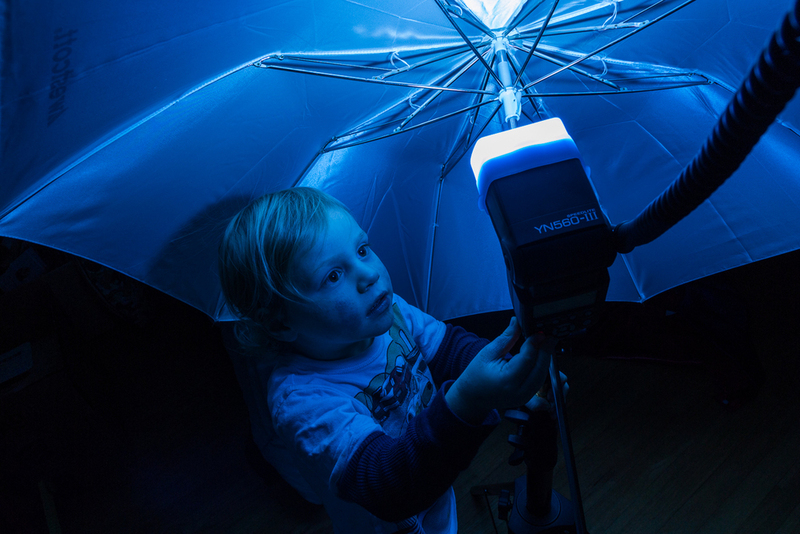 I picked up The Boy from daycare and got started setting up the light stand, shoot through umbrella, flash, sync chord, and camera. I asked The Boy to take off his shoes and start jumping away. He was having fun, I was having fun. The lighting rig was set up camera left at about 7 feet or so and pointed downwards. I wasn't getting the results I wanted, the room was over exposed from what I wanted to achieve. Despite this issue I was able to get a couple of cute shots. The Boy jumping with enthusiasm. The Boy needing a rest after jumping so much. I realized part of my issue. I still had auto ISO turned on my camera so all of my shots were at ISO 1600. I wanted the ISO to be at 100! I corrected my mistake. I lowered the flash and increased the intensity of the flash from about 1/64 to 1/8. I wanted some moody lighting to be moving from the lower left to the upper righthand side. Unfortunately The Boy was done with jumping. The thing with 3 year olds is that they are curious, very curious. The Boy wants to know about anything and everything. 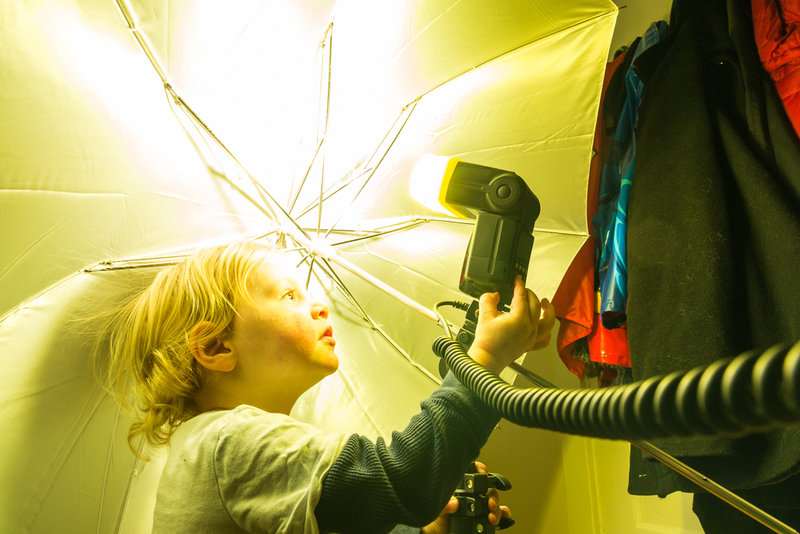 He decided that instead of jumping on the bed he wanted to inspect the flash and umbrella. The inspection turned into pressing the buttons and trying to make the flash work. Things ended up with pretending it was raining and The Boy needing to hang out under the umbrella because "it's raining." I took one shot of him next to the umbrella and liked the result and kept shooting. I couldn't be happier with the results. My favorite is at the end with using a blue diffuser on the flash. I wanna make it work! My favorite of the shots I took tonight, and possibly for awhile. Welcome to my first post on my blog. For 2014 I have decided to attempt a year long photo project to improve my skills. I thought about doing a 365 project and then quickly realized the error of that thinking. I have a very active 3 year old at home (what three year old isn't active?) and I like being an active and engaged father, so I don't really have time for a 365 project. The prospect of taking selfies at 11:59pm just is not appealing. Instead I am going to start on a 52 week project. Hopefully I will learn much and grow in my skills. I will be primarily using weekly photography assignments from www.digital-photography-school.com as my source of inspiration. I also have a new Diana F+ and a new Yonguo 560II flash that I will be learning how to use over the course of the next year. I'll have a separate post for the gear that I have at my disposal. I figure that I'm more likely to be successful if I put out this little project of mine into the world. That way I can use peer pressure from anonymous internet users to keep me honest. We'll see how things go. I'm very excited to see where this project will take me.